An exploratory trip full of initial promise with riffles, ledges, sandy-bottomed clear water, outstanding wildlife and little development, but also the most neglected and obstructed stream I have ever been on. Eventually, I had to give up on this segment after a considerable investment in time and effort. It’s just way too much of a mess. While low, I was surprised by how paddleable the water actually was. The releases from the Fall River dam must impact the river’s water levels downstream but to what degree I don’t know. This said, it doesn’t much matter because paddling this river is a fool’s errand. I repeat: Paddling this river is a fool’s errand. Time: Put in at 1:10p. Out at 5:00p. Time: Put in at 11:50a. Out at 4:00p. Wildlife: Deer, frogs, softshell turtles (including eggs), great blue heron, sandhill cranes, hawks, turkey vultures, owls, clams, damselflies and oh so many spiders. I don’t know how I even got this idea in my head in the first place. Maybe someone asked me about it in the past. Maybe I just liked the implication of a town named “Fall River.” But my intention was to paddle from the dam in Fall River to the dam in Columbus, a distance of 9 miles. The initial premises were compelling: very good put-in and takeout, a couple railroad bridges in the countryside, a cool old truss bridge towards the end, the novelty of passing underneath Highway 151, a pretty and sprawling public wetlands area and a trip only half an hour from my house. 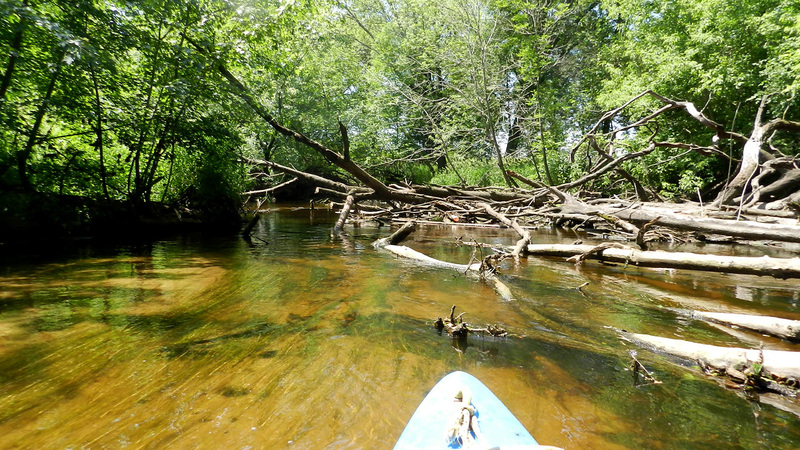 I knew there would be a likelihood of running into downed trees and logjams since this is a rather obscure section of the Crawfish River – the first two miles of this trip are actually on the north branch of the Crawfish River. But oh my God for the love of all things holy, I could never have imagined it would be so bad. I’m not exaggerating one iota when I say definitively, that this was/still is the worst obstructed river I’ve ever been on. Seriously. I didn’t bother counting, because I cleared out each one I could. Until I just gave up, capitulating after defeat, after two days of giving my all to the horrific neglect. In short, I stopped caring after I started cursing. But let me explain something. I first attempted this paddle on Monday, June 8. I naively put in just after 1 in the afternoon. In retrospect, I should have put in at 1:00 am to give myself enough time to reach Columbus. The first half-mile was riffly fun with half a dozen ledges that in higher water would be a blast. After that the streambed becomes sandy, the water beautifully clear; there’s nothing but a forest-like setting of trees and no visual signs of development anywhere, and the wildlife was awesome. It had all the makings for a great discovery – except for the insane number of obstructions. Only half an hour from my house and with all the other good it had going for it, I decided to adopt this river. It would be a great investment for future paddling and paddlers. However long it took, I would clear it out and make it accessible. Why? Because A) I’m stubborn and determined like that B) it’s the right thing to do and C) I’m unemployed right now anyway. Now let me put this in context. The first day I did this it took me 4 hours to paddle 1 mile. I sawed and clipped like a man on a mission. I uprooted wayward branches half-buried in the sand. I dropkicked dead limbs to give clearance. I hauled off bobbing stumps and towed whole trees from underneath logjams to shallow strands off to the side. I threw branches, limbs and whole saplings over the banks like an excavator on the fritz. I got scraped, chafed, nicked, sliced, poked, pierced, bit, bruised and banged. I hyperextended my right wrist and left shoulder. I plucked off my legs, lap, neck, arms and hair well over 20 spiders (mostly longlegs and water spiders; though I did see at least three wolf spiders, which I really can’t adequately articulate how much creeps me out). I called it a day when the sky turned slate gray, thunder rumbled and flashes of lightning pulsed. And then the rain just poured. But that’s another story. So the second day I thought I’d give it a go again. How much worse could it possibly be than what I’d already encountered? Answer: a lot! So much so, I could have used an axe – like the kind firefighters have when chopping out an emergency hole in a roof. I was prepared for and anticipating a sweaty, exhausting all-day affair, but when a logjam is several feet higher than the water surface itself (to say nothing of the bottom of the streambed) and spans each bank like the Hoover Dam, you start feeling like David against Goliath. And I had no secret slingshot. And the several steeplejacks of fallen trees were too thick to try to cut down without power tools and too low to paddle under. One after another like that, over and over, you just feel outnumbered. Or just numb. I cleared out what I could – and to be fair, it was most of the obstructions but after a while – it simply became pointless. Why even bother? The game’s rigged. I called it quits after a segment of maybe 100 yards where I had no choice but to portage at least four times. I started walking my boat rather than getting in and out, in and out. Even at the point where the treacherous but pretty north branch meets with the main branch of the Crawfish (aka “Crawfulfish”), there are still as many obstructions and nuisances as upstream. In fact, all that changes at that junction is that the river is deeper, which is to say muddy and unbecoming. By the time I reached the bridge at Fall River Road, it was 4pm. From there it’s still six miles to Columbus and I had already been on the water (I can’t really call it “paddling”) since noon. Four hours and I’d gone only two miles. Pitiful. Out of curiosity I ventured just 50 yards downstream from the bridge and lo and behold there was another monstrously humongous logjam. And from what I could discern, still more cluttered litter after that. “Screw this!” I said to myself (not what I’d wanted to say but there was a young boy with his father fishing at the bridge). I knew it would eventually get better, which is to say wider and more meadowy and thus obstruction-free, but I was done. Done with this river. Done with this dumb idealism of adopting a stream in the first place all by myself without the sensible tools of clearing it out. Alas, I’m no John Henry. Over the span of 2 days I spent 8 hours and paddled less than 3 miles. A guy’s gotta draw a line somewhere. The Fall River dam is located in the town’s attractive Brayton Park. There’s an official boat launch for paddling above the dam, i.e., the fake lake impoundment that looks pretty in its own right if you like flatwater paddling or sharing water with powerboats. But putting-in below the dam is easy and accessible. The first half-mile is a lot of fun. Tall banks flanking the backyards of houses on a narrow stream give you the feeling of paddling in a secret, intimate environment. The half-dozen small ledges and riffles enhance this intimacy. The river (really, a creek) flows behind the Fall River High School (“Pirate Pride!”) and the marching band was rehearsing. Nothing like sassy brass and boom-boom drums serenading you on a stream! Just past the high school is a pleasant park and the best ledges (probably 8-10”). After the park the river sneaks inside what feels like a remote forest. Woods enclose, the bottom is golden sand, and there isn’t a hint of development anywhere in sight. I saw deer, owls, softshell turtles, songbirds of all bands and feisty fish in the clear water. It was gorgeous, and I was shocked; I had no idea A) the Crawfish River could look like this or B) that such an environment is so close to my own home. As mentioned, part of the reason I’d paddled only one mile on the first day is because a thunderstorm suddenly swept through. I saw it coming since the sky became increasingly dark, but I didn’t know what to do. The dilemma was this: I hadn’t even reached the first railroad bridge, much less the next bridge after that at Johnson Street, where I could’ve taken-out and walked back to the car at the put-in. I knew I was near the railroad bridge due to the proximity of trains coming and going but the river was so obstructed and I’d already made so little forward progress, that it seemed foolish to forge ahead. By contrast, if I just turned around and paddled back upstream, I knew that it would be clear since that’s all I’d been doing for the last four hours. It was a humbling concession, but a necessary one. And that’s when it started to rain – a total downpour, thunder, lightning, the whole works. I was wet and filthy anyway but the rain was cold and beating down pretty hard. Even though I started to shiver, I had to laugh after a while. Fortunately, it was a quick downpour, probably only 20 minutes. And afterward, serpentine plumes of steam rose from the river because its temperature was notably warmer than the cold rain from the clouds above. I wasn’t in much of a good mood to ponder the potential mysticism of such a scene, but it was a cool visual effect, I have to admit. The railroad bridges themselves were nothing to write home about, but there are little ledges beneath each. Plus it’s the Amtrak line – you know, light rail? I grew up on Amtrak outside of New York City, so there’s a hint of nostalgia for me personally. Also, Columbus is a pretty cool little town with a lot of visual aesthetics to love. Not that I ended up in Columbus on either trip – not by a long shot. But the city hall, Farmers and Merchants Union Bank, (the bank is a Louis Sullivan building, for architecture aficionados) and Kurth Brewery buildings alone are worth going to Columbus to check out. The amount of tree debris is just menacing. I don’t want to sound redundant, but it’s impossible to convey just how obstructed this short stretch of river is. Three miles in eight hours… it almost hurts my head to think about that! What does hurt, is it feels like it was all for nothing. I gave up in the end (though nowhere near my intended end). It’s possible that I’d bitten off more than I could chew on my second day. It’s possible that if I returned for a third time to just before where I gave up and approached it with a new perspective I might be less dismissive and more circumspect. I don’t know, and I don’t know if that thought experiment is worth enabling. At what point does one stop being stubborn and concede to reality? Was it an ego thing, trying to resuscitate a river? I can all but guarantee that nobody had been down this segment of the river before. But some things just aren’t meant to be. I don’t like giving up – you might say it sticks in my craw(fish) – but at what point does such an expenditure of time and will become a Pyrrhic victory? I think I’m OK with dropping this. There are so many other rivers and creeks to explore. It does feel like a shame to let this one go, especially after the amount of time and effort trying to clear it out. But that can be applied to a lot of things in life, can’t it? Sometimes we need to just walk away. I’m fairly certain that not long after Fall River Road the river does clear up (you can see this from the satellite map). But how much more crap does one have to put up with before finding clearance? And is it worth it? At that point the Crawfish is surrounded by uninspiring agriculture, the constant noise from Highway 151, the last leg of this trip heading into Columbus is entirely residential and the water is flat, brown and slow. So is it really worth it? That’s a philosophical question, I suppose, not unlike that age-old koan “if a tree falls in a forest and no one’s there to hear it, does it still make a sound?” Beats me. But I’ll tell you this much: If a tree falls, it falls into the Crawfish River. I’d bring ten of the burliest Lumberjacks and -jills to first clear the [expletive deleted] river whilst I sat back drinking a hard-earned beer and then maybe I’d reconsider paddling this. n/a (on my first attempt I walked ¾ of a mile back to my car. On the second attempt I walked 1.4 miles back). Put-in below dam in Fall River. Fun riffles in an intimate setting through town. Great ledge below pedestrian bridge in a public park in Fall River. …but also horribly clogged with deadfall and logjams. I cleared out a passage here on the far left. Looking upstream at first railroad bridge. Worse logjams below second railroad bridge. …and some not so much.